WASHINGTON, Mar 13 2013 (IPS) - In an unusual public testimony, the U.S. government has publicly stated that no “indefinite detention” is taking place among detainees at the military prison in Guantánamo Bay. “The United States only detains individuals when that detention is lawful and does not intend to hold any individual longer than is necessary,” Michael Williams, a senior legal advisor for the State Department, told a hearing at the Inter-American Commission on Human Rights. The testimony took place Tuesday as a panel of human rights lawyers appealed before an international human rights body over what they called an “unfolding humanitarian crisis” at the military prison, calling for an end to ongoing human rights violations they say are being committed against the detainees. The hearing, at the Organisation of American States headquarters here in Washington, marked the first time since President Barack Obama’s re-election that the U.S. government has had to publicly answer questions concerning Guantánamo Bay. Legal representatives for the detainees also presented disturbing eyewitness accounts of prisoner despair at the facility, brought on by prolonged indefinite detention and harsh conditions that has led to a sustained hunger strike involving more than 100 prisoners at the U.S. base in Cuba. Established in 2002, the Guantánamo Bay military prison held, at its height, more than 700 suspects of terrorism. The facility currently holds 166 prisoners, of whom 90 – most of them Yemenis – have reportedly been cleared for repatriation, while another 36 are due to be prosecuted in federal courts, although those trials have yet to take place. The remaining are being held indefinitely without trial because evidence of their past ties to terrorist groups is unlikely to be admissible in court. In some cases, this is reportedly due to its acquisition by torture, while in other cases because the U.S. government believes that the suspects would return to extremist activities if they were to be released. The IACHR has repeatedly called for the closure of the Guantánamo Bay detention centre, and has requested permission to meet with the men detained there. The U.S. government has failed to allow the hemispheric rights body permission to make such a visit, however. The IACHR held Tuesday’s hearing to learn more about the unfolding humanitarian crisis at the Guantánamo prison. It also focused on new components to the National Defense Authorization Act (NDAA), signed earlier this year, which has been criticised for authorising indefinite detention and restricts the transfer of Guantánamo detainees. Tuesday’s hearing saw testimony from experts in law, health and international policy, covering the psychological impact of indefinite detention, deaths of some suspects at Guantánamo, the lack of access to fair trials, and U.S. policies that have restricted the prison’s closure. On taking office four years ago, President Obama famously promised to close the prison and ordered an end to certain interrogation tactics that rights groups called “torture”, including “extraordinary rendition” to third countries known to use torture. Yet he has since relied to a much greater extent on drone strikes against “high value” suspected terrorists from Afghanistan, Pakistan, Yemen and Somalia, while failing to close the prison. Yet Farah is clear in his view that reversing this trend is still well within President Obama’s power. “This is something that really calls for leadership from the president – he needs to decide if he wants Guantánamo to be part of his legacy,” Farah says. Human rights activists claim the Obama administration has not only broken his promise to rapidly close Guantánamo, but that his administration has also extended some of the worst aspects of the system. They point to the administration’s continuance of indefinite detention without charge or trial, employing illegitimate military commissions to try some suspects, and blocking accountability for torture. At Tuesday’s hearings, the State Department’s Williams made extensive note of the health facilities and services that the U.S. government has made available for the detainees. And while critics do admit that the government facilities do meet international standards for detainees’ physical needs, they note that the mere fact of indefinite detention inflicts a toll all its own. “The hopelessness and despair caused by indefinite detention is causing an extremely pressing and pervasive health crisis at Guantánamo,” Kristine Huskey, a lawyer with Physicians for Human Rights, an advocacy group, told IPS. At Tuesday’s hearing, however, Williams refused even to admit that indefinite detention was taking place at Guantánamo. CCR’s Farah called the whole experience “very disheartening”. Farah says the CCR wants to see Guantánamo closed and all prisoners Washington does not intend to charge with crimes to be allowed to return home or be sent to a safe country. “That’s just a base level international legal requirement,” he said. 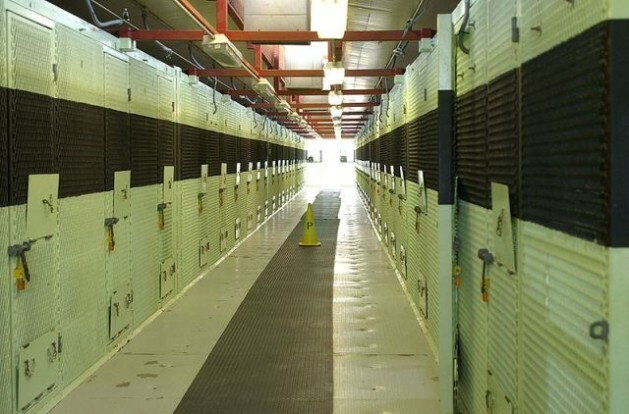 The photo shown above is not a cellblock on which any detainees at Guantanamo Detention Center reside. And for the record, no one resides in Camp Delta. Lets see, held for over a decade with no date for “trial” – That detention definitely is the indefinite!